Paolini: Is cost per bit a reliable metric for wireless data? Cost per bit is a useful metric to capture costs associated with the delivery of data, and make comparison across technologies, operators, or markets. Yet cost per bit estimates cited as absolute values (e.g., $5/GB) can provide a good punch line, but they are often misleading or inaccurate. At the very least, cost per bit estimates should be used only when the assumptions made to calculate it are known, which typically is not the case when using third-party estimates. Still, I use cost-per-bit estimates all the time. When working on a financial model, they provide a very useful way to think about the implication of different choices, for instance different types of base stations, backhaul options, or wireless technologies. Within a self-contained financial model, the assumptions are consistently used and under control, and the resulting cost-per-bit estimates can be safely compared to decide which option is the most cost effective. When used as a blanket estimate, maybe to compare two operators or two technologies, the cost per bit often ceases to be informative because it depends on many unknown assumptions that interact with each other. A major source of difference in cost per bit is geography and population density. We can expect the cost per bit to be lower in densely populated country like Hong Kong versus Canada, where operators have to cover vast sparsely populated areas, as the number of base stations to support the same amount of traffic is lower. At the same time, the presumably higher cost to install and operate base stations in Hong Kong (it is typically cheaper to install and operate base stations outside urban areas) will reduce--or may even eliminate--the difference in the cost per bit in the two markets. Cost-per-bit estimates include both the capex and opex components and are usually calculated across an operator's entire network. But there is a lot of variability in traffic load at different locations, and how spiky is its distribution throughout the day. In turn, these variable depend on where and where subscribers are, and the incentives they have to use the service at certain times and/or locations. If we were to compute the cost per bit at each location, we would get wildly different estimates--with the cost per bit being typically lower at base stations running at capacity. Network utilization ratios capture the average utilization of network resources across the footprint and are closely linked to cost per bit estimates. Cellular networks inevitably underuse the available capacity both because of the requirement to cover low density areas, and because usage is not uniform through the day, but networks need to accommodate peak traffic. As a result, cellular networks are designed to meet coverage targets and expected peak traffic load at each location. As an example, network utilization at Vodafone is 38%, with 7% of sites running at 90% or higher capacity during peak hour. In the U.S., we expect network utilization to be lower due to the lower population density, but regrettably U.S. operators do not publicly release network utilization figures. When adding a new network such as LTE, the initial network utilization is abysmally low, simply because subscribers have not yet moved to devices that can access the network. As the number of subscribers increases, so does the network utilization. The variability in utilization ratio and the inevitable underuse of overall network resources are rarely mentioned but have important consequences that go beyond the cost per bit. Often, spectrum and capacity requirements are computed across the overall network as if traffic were homogeneously distributed. But this is never the case: For each operator the concentration of traffic varies depending on the distribution of subscribers across its footprint (and, of course, the distribution and density is not the same even for operators in the same market). As a result, spectrum requirements calculated assuming a homogeneous traffic distribution may not accurately take into account mobile operators' need to accommodate traffic loads in high-density areas, and are prone to underestimate the spectrum allocation needed. Similarly, the capacity requirements estimated on a per-square-mile basis for the total coverage area will lead to an underestimation of the capacity levels needed in high-density areas. Assuming the cost of installing and operating a base station is constant regardless of the traffic it carries (and it largely is), the cost per bit varies as a function of network utilization. The graph shows how the cost per GB is affected by transported traffic loads, and specifically how it drops as the network utilization increases for different levels of peak-to-average traffic. During the initial stage of a greenfield installation, the operator has to establish coverage and has few subscribers. Established mobile operators also have few subscribers on a new network as subscribers are still on older networks. As a result, the base stations are still underutilized and the cost per bit can be extremely high. As the number of subscribers grows, the cost per bit drops. But demand increases to the point that the operator needs to install new base stations. Once they are in place, the cost per bit goes back up. Most mobile operators understand this, and when computing the cost per bit for their networks, they take these factors into account and compute the cost per bit over a period that serves their purposes. However, comparing such metrics across countries, operators, or technologies can produce highly inaccurate results if the underlying assumptions are different--or unknown. The cost-per-bit metric can be especially misleading when looking at the marginal cost of adding capacity, rather than at the overall network costs. When an operator adds base stations in congested areas, it expects that the new base stations will run close to capacity and therefore have a marginal cost per bit that is substantially lower than the one for the entire network. Conversely, when adding a base station in a rural area for coverage, the marginal cost per bit is generally higher because the costs are similar to the urban new base station, but traffic load is lower. At the same time, looking only at the marginal cost per bit of adding capacity leads to incorrect estimates of the overall costs of providing high-bandwidth data services. The marginal cost may be sufficiently low that the data services appear quite profitable on a revenue-per-bit basis for the new base stations. But to get an appropriate estimate of overall service profitability, the cost and revenues have to be computed across the entire network, and over an extended period of time. If we look only at the marginal costs, we run the risk of relaying on a business model in which voice revenues--i.e., the existing legacy network built for coverage and, until recently, used primarily for voice--subsidize data services. To some extent, this subsidization is exactly what has happened over the last few years, but as data traffic and revenues become dominant, data services have to be self-sustaining. These considerations are increasingly coming to the fore as operators assess different options to increase capacity in their networks and need to identify the most cost-effective solution. In this context, cost per bit is a very handy metric to capture differences, but it can also lead to erroneous conclusions if the cost per bit computed for the alternatives relies on inconsistent sets of assumptions--or on assumptions that do not apply to the operator conducting the evaluation. Figure 1. 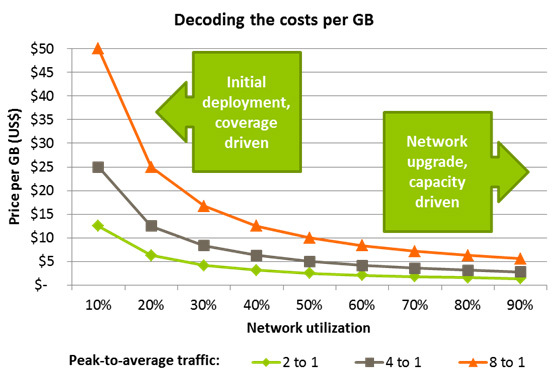 Cost per GB as a function of network utilization and peak-to-average traffic, assuming a cost per bit of $5/GB at 50% network utilization, for a 4:1 peak-to-average traffic. The three lines show the cost curve for a different cost per bit at three different peak-to-average traffic levels, as the network utilization increases moving to the right. 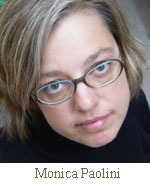 Monica Paolini, PhD, is the founder and president of Senza Fili Consulting and can be contacted at [email protected]. Senza Fili Consulting provides expert advisory services on wireless data technologies and services.